First Published in 1894 and reprinted several times since the Gospel of Buddha by Paul Carus has attained the stature of a classic today. This book is not designed to contribute to the solution of historical problems nor is it an attempt at popularizing the Buddhist religious writings. It sketches the picture of a religious leader of the remote past with the view of making it bear upon the living present and become a factor in the formation of the future. 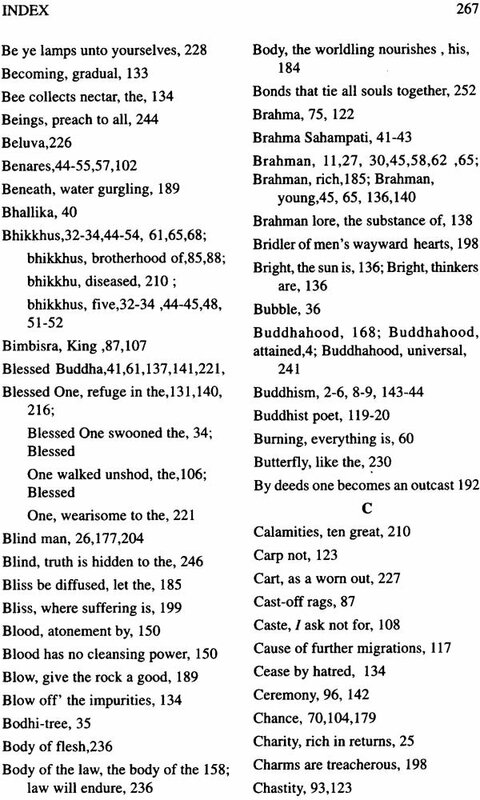 The bulk of its contents is derived from the old Buddhist canon many passages and indeed the most important ones are literally copied in translations from the original texts some are rendered freely other have been rearranged and still others are abbreviated. Dr. Paul Carus captures in his simple and sensitive prose as Olga Kopetzky has done in her delicate drawings to the volume the radiant spirit of Buddhism and the poetic grandeur of the Buddha’s personality. 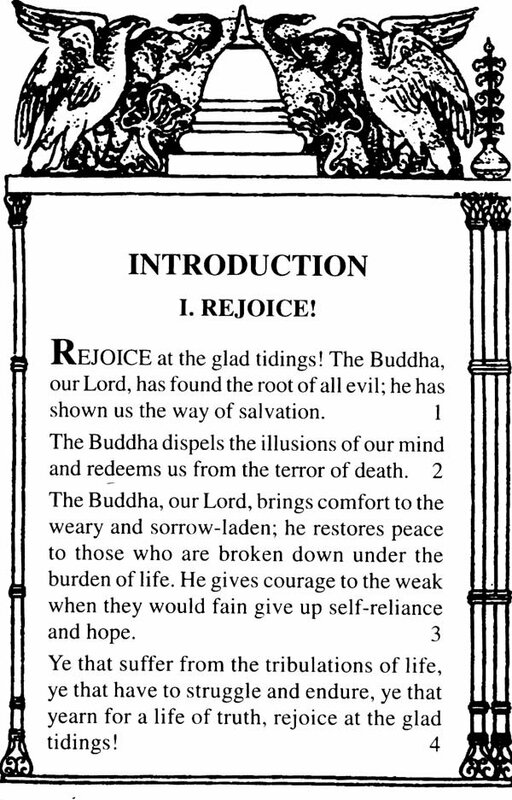 This booklet needs no preface for those who are familiar with the sacred books of Buddhism which have been made accessible to the Western world by the Indefatigable zeal and industry of scholars like Beal Bigandet, Buhler, Burnouf, Childers Alexander Csoma Rhys Davids Dutoit, Eitel, Faushboll, Foucaux, Francke, Edmund Hardy, Spence Hardy, Hodgson, Charles R. Lanman, F. Max Muller Karl Eugen Neumann, Oldenberg, Pischel, Schiefner, Senart, Seidenstucker, Bhikkhu Nyanatiloka, D.M. Strong, Henry Clarke Warren, Wassiljew Weber windisch, Winterniz & C. to those not familiar with the subject it may be stated that the bulk of its contents is derived from the old Buddhist canon. 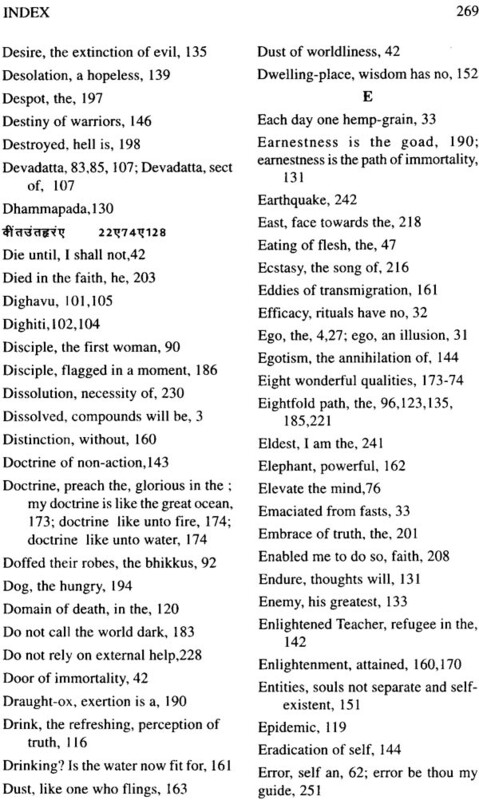 Many Passages and indeed the most important ones are literally copied in translations from the original texts. Some are rendered rather freely in order to make them intelligible to the present generation others have been rearranged and still others are abbreviated. Besides the three only a few purely original additions which however are neither mere literary embellishments nor deviations from Buddhist doctrines. Wherever the compiler has admitted modernization he has done so with due consideration and always in the spirit of a legitimate developments. Additions and modifications contain nothing but ideas for which prototypes can be found somewhere among the traditions of Buddhism, and have been introduced as elucidations of its main principles. The best evidence that this book characterizes the spirit of Buddhism correctly can be found in the welcome it has received throughout the entire Buddhist world. It has even been officially introduced in Buddhist schools and temples of Japan and Ceylon. Soon after the appearance of the first edition of 1894 the Right Rev. 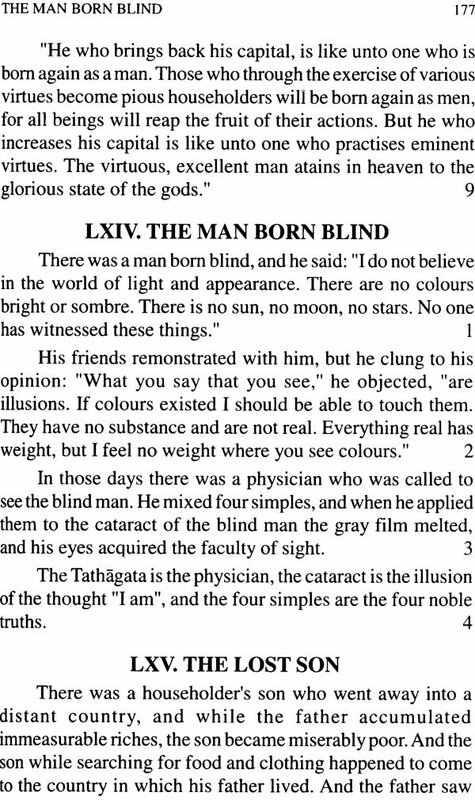 Shaku Soyen, a prominent Buddhist abbot of Kamakura, Japan, had a Japanese translation made by Teitaro Suzuki, and soon afterwards a Chinese version was made by Mr O’Hara of Otzu, the talented editor of a Buddhist periodical, who in the meantime has unfortunately met with a premature death. In 1895, the Open Court Publishing Company brought out a German edition by E.F.L. Gauss, and Dr L. de Millou, the curator of the Mus e Guimet, of Paris, followed with a French translation. Dr Federigo Rodriguez has translated the book into Spanish and Felix Orth into Dutch. The privilege of translating the book into Russian, Czechic, Italian, also into Siamese and other Oriental tongues has been granted, but of these latter the publishers have received only a version in the Urdu language, a dialect of eastern India. Inasmuch as twelve editions of The Gospel of Buddha have been exhausted and the plates are worn out, the publishers have decided to bring out an edition deluxe and have engaged Miss Olga Kopetzky, of Munich, to supply illustration. The artist has undertaken the task methodically and with great zeal. She has studied in the Ajanta caves the Buddhist paintings and sculptures and other monuments of Gandhara. Thus the drawings faithfully reflect the spirit of the classical period of Buddhist art. 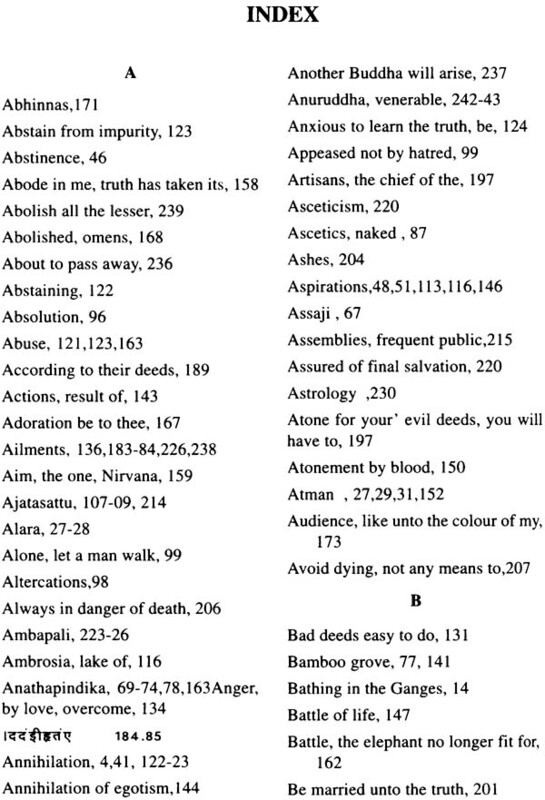 For those who warn to trace the Buddhism of this book to its fountainhead, a table of reference has been added, which indicates as briefly as possible the main sources of the various chapters and points out the parallelisms with Western thought, especially in the Christian Gospels. Buddhism, like Christianity, is split up into innumerable sects, and these sects not infrequently cling to their sectarian tenets as being the main and most indispensable features of their religion. The present book follows none of the sectarian doctrines, but takes an ideal position upon which all true Buddhists may stand as upon common ground. Thus the arrangement into a harmonious and systematic form is the main original feature of this Gospel of Buddha. 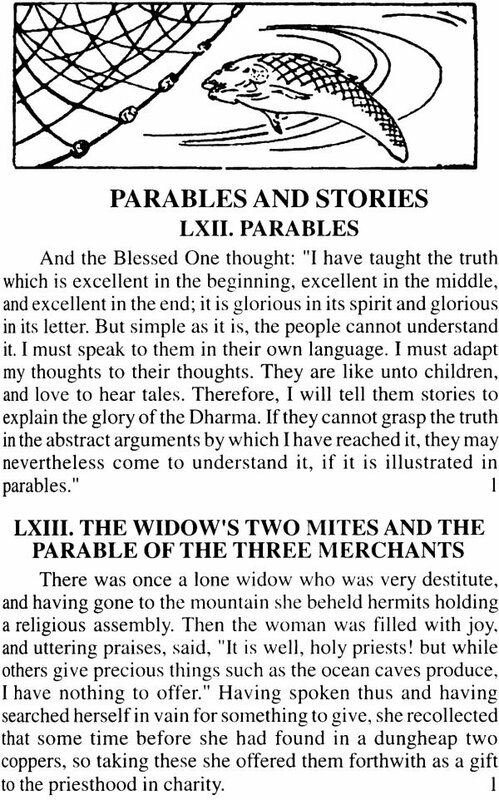 Considering the bulk of the various details of the Buddhist canon, however, it must be regarded as a mere compilation, and the aim of the compiler has been to treat his material in about the same way as he thinks that the author of the Fourth Gospel of the New Testament utilized the accounts of the life of Jesus of Nazareth. 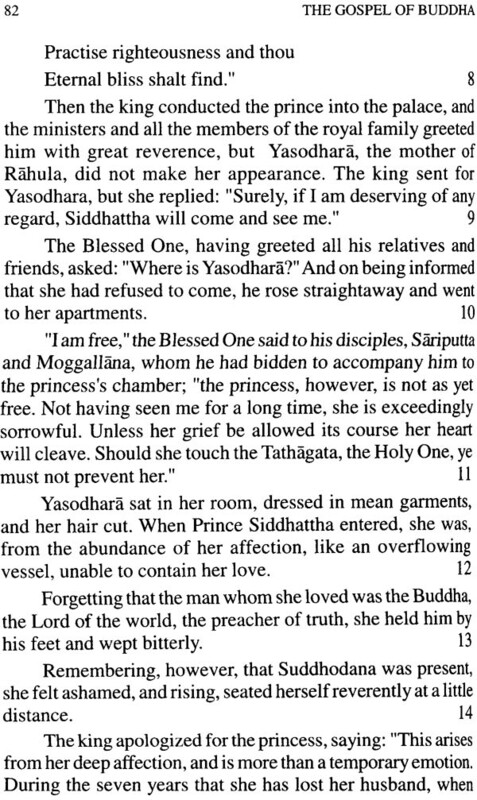 He has ventured to present the data of the Buddha’s life in the light of their religio philosophical importance; he has cut out most of their apocryphal adornments, especially those in which the Northern traditions abound, yet he did not deem it wise to shrink from preserving the marvelous that appears in the old records, whenever its moral seemed to justify its mention; he only pruned away the exuberance of wonder which delights in relating the most incredible things, apparently put on to impress while in fact they can only tire. Miracles have ceased to be a religious test; yet the belief in the miraculous powers of the Master still bears witness to the holy awe of the first disciple and reflects their religious enthusiasm. Lest the fundamental idea of the Buddha’s doctrines be misunderstood, the reader is warned to take the term “self’ in the sense in which the Buddha uses it. The “self of man translates the word ätman which can be and has been understood, even in the Buddhist canon, in a sense to which the Buddha would never have made any objection. The Buddha denies the existence of a “self’ as it was commonly understood in his time; he does not deny man’s mentality, his spiritual constitution, the importance of his personality, in a word, his soul. 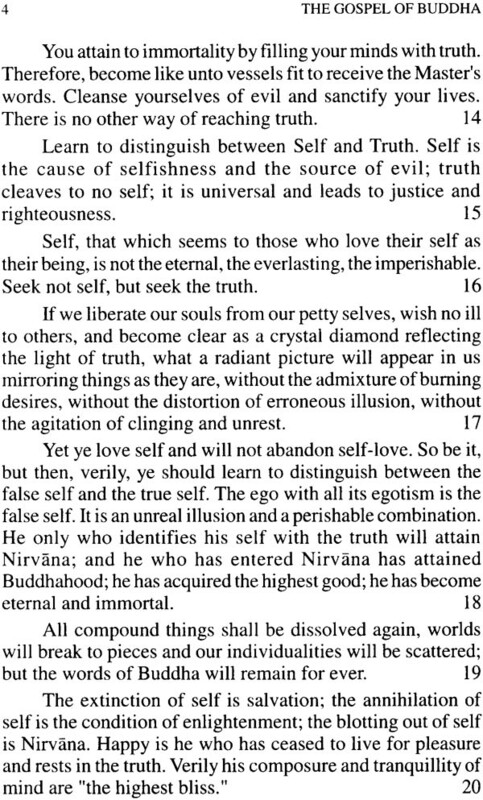 But he does deny the mysterious ego-entity, the atman, in the sense of a kind of soul-monad which by some schools was supposed to reside behind or within man’s bodily and physical activity as a distinct being, a kind of thing in-itself, and a metaphysical agent assumed to be the soul. Buddhism is monistic. It claims that man’s soul does not consist of two things, of an atman (self) and of a manas (mind or thoughts), but that there is one reality, our thoughts, our mind or manas, and this manas constitutes the soul. Man’s thoughts, if anything, are his self, and there is no atman, no additional and separate “self’’ resides. Accordingly, the translation of atman by “soul”, which would imply-that the Buddha denied the existence of the soul, is extremely misleading. 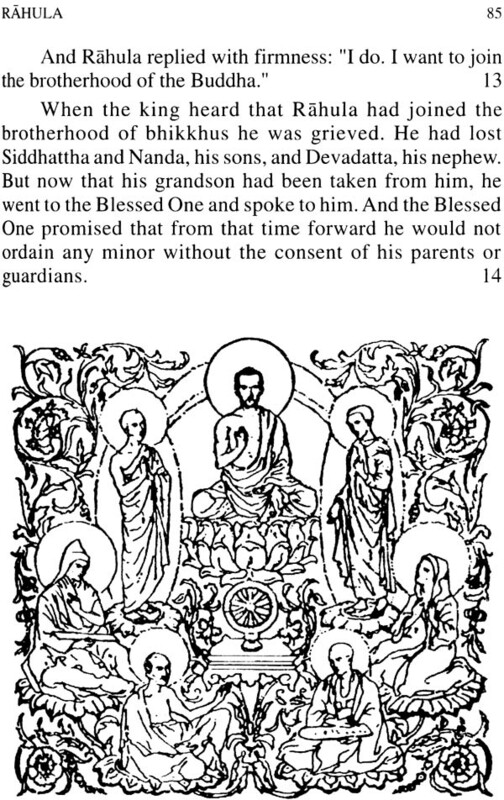 Representative Buddhists, of different schools and of various countries, acknowledge the correctness of the view here taken, and we emphasize especially the assent of Southern Buddhists because they have preserved the tradition most faithfully and are very punctilious in the statement of doctrinal points. This atman-superstition, so common not only in India, but all over the world, corresponds to man’s habitual egotism in practical life. Both are illusions growing out of the same root, which is the vanity of worldliness, inducing man to believe that the purpose of his life lies in his self. The Buddha proposes to cut off entirely all thought of self, so that it will no longer bear fruit. 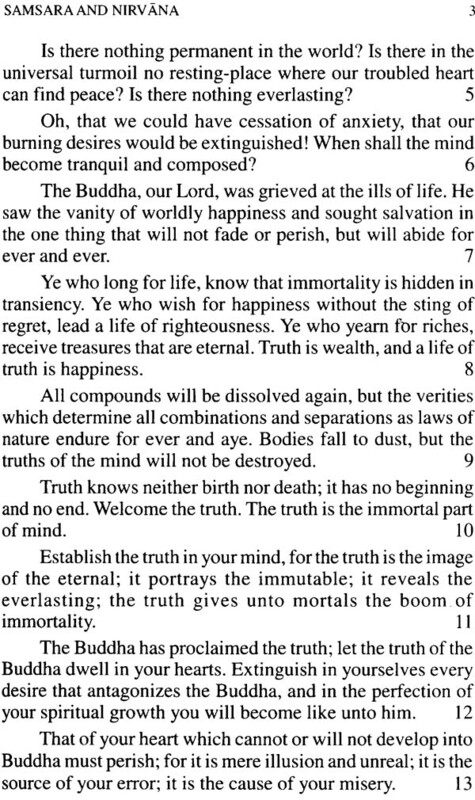 Thus Nirvana is an ideal state, in which man’s soul, after being cleansed from all selfishness, hatred and lust, has become a habitation of the truth, teaching him to distrust the allurements of pleasure and to confine all his energies to attending to the duties of life. The Buddha’s doctrine is not negativism. An investigation of the nature of man’s soul shows that, while there is no atman or ego-entity, the very being of man consists in his karma, his deeds, and his karma remains untouched by death and continues to live. 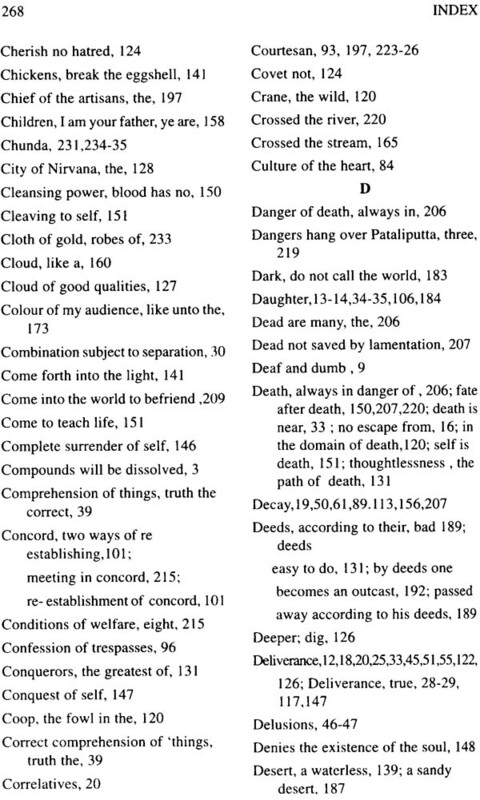 Thus, by denying the existence of that which appears to be our soul and for the destruction of which in death we tremble, the Buddha actually opens (as he expresses it himself) the door of immortality to mankind; and here lies the corner-stone of his ethics and also of the comfort as well as the enthusiasm, which his religion imparts. Anyone who does not see the positive aspect of Buddhism, will be unable to understand how it could exercise such a powerful influence upon millions and millions of people. The present volume is not designed to contribute to the solution of historical problems. The compiler has studied his subject as well as he could under the circumstances, but he does not intend here to offer a scientific production. Nor is this book an attempt at popularizing the Buddhist religious writings, nor at presenting them in a poetic shape. 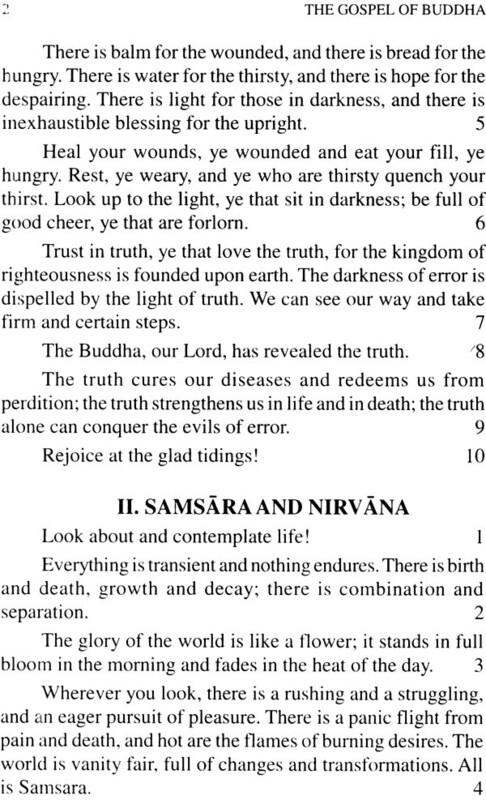 If this Gospel of Buddha helps people to comprehend Buddhism better, and if in its simple style it impresses the reader with the poetic grandeur of the Buddha’s personality, these effects must be counted as incidental; its main purpose lies deeper still. The present book has been written to set the reader thinking on the religious problems of today. It sketches the picture of a religious leader of the remote past with the view of making it bear upon the living present and become a factor in the formation of the future. The main trouble arises from a wrong conception of Christianity. There are many Christians who assume that Christianity alone is in the possession of truth and that man could not, in the natural way of his moral evolution, have .obt4ined that nobler conception of life which enjoins the practice of a universal good-will towards both friends and enemies. This narrow view of Christianity is refuted by the mere existence of Buddhism. Must we add that the lamentable exclusiveness that prevails in many Christian churches, is not based upon Scriptural teachings, but upon a wrong metaphysics? All the essential moral truths of Christianity, especially the principle of universal love, of the eradication of hatred, are in our opinion deeply rooted in the nature of things, and do not, as is often assumed, stand in contradiction to the cosmic order of the world. Further, some doctrines of the constitution of existence have been formulated by the church in certain symbols, and since these symbols contain contradictions and come in conflict with science, the educated classes are estranged from religion. Now, Buddhism is a religion which knows of no supernatural revelation, and proclaims doctrines that require no other argument than the “come and see.” The Buddha bases his religion solely upon man’s knowledge of the nature of things, upon provable truth. Thus, we trust that a comparison of Christianity with Buddhism will be a great help to distinguish in both religions the essential from the accidental, the eternal from the transient, the truth from the allegory in which it has found its symbolic expression. We are anxious to press the necessity of discriminating between the symbol and its meaning, between dogma and religion, between meta physical theories and statements of fact, between man-made formulas and eternal truth. And this is the spirit in which we offer this book to the, public, cherishing the hope that it will help to develop in Christianity not less than in Buddhism the cosmic religion of truth. The strength as well as the weakness of original Buddhism lies in its philosophical character, which enabled a thinker, but not the masses, to understand the dispensation of the moral law that pervades the world. As such, the original Buddhism has been called by Buddhists the little vessel of salvation, or Hinayana; for it is comparable to a small boat on which a man may cross the stream of worldliness, so as to reach the shore of Nirvana. 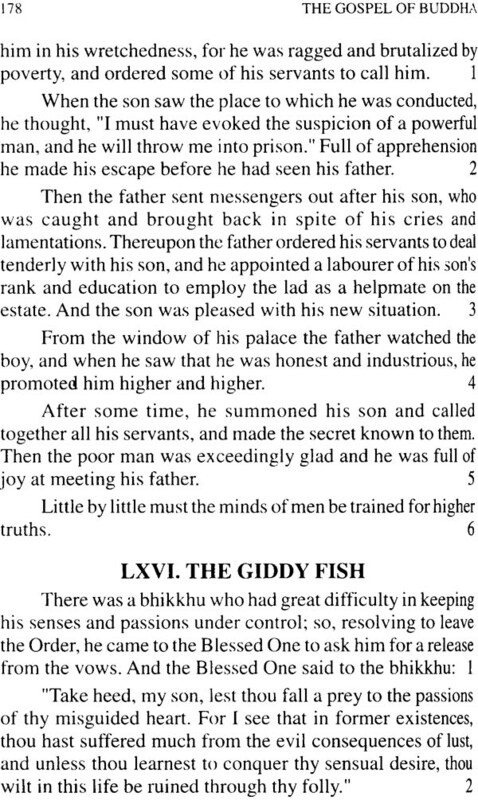 Following the spirit of a missionary propaganda, so natural to religious men who are earnest in their convictions, later Buddhists popularized the Buddha’s doctrines and made them accessible to the multitudes. It is true that they admitted many mythical and ‘even fantastic notions, but they succeeded nevertheless in bringing its moral truths home to the people who could but incompletely grasp the philosophical meaning of the Buddha’s religion. They constructed, as they called it, a large vessel of salvation, the Mahayana, in which the multitudes would and room and could be safely carried over. Although the Mahayana unquestionably has its shortcomings, it must not be condemned offhand, for it serves its purpose. Without regarding it as the final stage of the religious development of the nations among which it prevails, we must concede that it resulted from an adaptation to their condition and has accomplished much to educate them. The Mahayana is a step forward in so far as it changes a philosophy into a religion, and attempts to preach doctrines that were negatively expressed, in positive propositions. Far from rejecting the religious zeal which gave rise to the Mahayana in Buddhism, we can still less join those who denounce Christianity on account of its dogmatology and mythological ingredients. Christianity has certainly had and still has a great mission in the evolution of mankind. It has succeeded in imbuing with the religion of charity and mercy the most powerful nations of the world, to whose spiritual needs it is especially adapted. It extends the blessings of universal good-will with the least possible amount of antagonism to the natural selfishness that is so strongly developed in the Western races Christanity is the religion of love made easy. This is its advantage which however is not without its drawbacks. Christianity teaches charity without dispelling the ego illusion and in this sense it surpasses even the Mahayana: it is still more adapted to the needs of multitudes than a large vessel fitted to carry over those. Who embark on it : it is comparable to a grand bridge a Mahasetu on which a child who has no comprehension as yet of the nature of self can cross the stream of self hood and worldly vanity. A comparison of the many striking agreements between Christianity and Buddhism may prove fatal to sectarian conception of either religion but will in the end help to mature out insight into the true significance of both. It will bring out a nobler faith which aspires to be to the cosmic religion of universal truth. Let us hope that this Godpel of Buddha will serve both Buddhists and Christians as a help to penetrate further into the spirit of their faith so as to see its full height length and breadth. Above any Hinayana, Mahayana, and Mahasetu is the Religion of Truth.